Posted By PA Breast Cancer Coalition on May 10th, 2016 at 4:23 pm | 0 comments. As soon as I turned 40 I went for an annual exam and mammogram and before I knew it, I was assigned to a breast cancer surgeon. I had chemo and radiation and chose lumpectomy. That was in 2008, it was stage 1 cancer and I’m happy to say I’m cancer free today. Sometimes, as women, we love to be the caregiver and can have a hard time processing being helped. But you can’t go through this alone. For me, that support person was my sister-in-law. She came with me to all my medical appointments and she inspired me to keep a journal. The journal became a book, and when it became so popular it grew into a foundation. The book is called “Touch and Agree” and that’s also the name of the foundation. I witnessed patients who had the same type treatment I did but whose insurance didn’t completely cover the cost of their medications. One of my children’s teachers shared with me that she had tapped out her savings paying for medications that her insurance didn’t cover. I knew there was a need for resources and the Touch N Agree Foundation helps women to cover those costs. I work as a senior customer service representative for Independence Blue Cross. 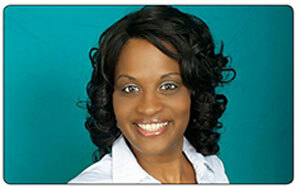 I help people to understand their benefits and help them with their billing questions. I like to travel, especially to any place with a beach. My favorite spot is Cocoa Beach in Orlando, Florida. Before I was diagnosed with breast cancer, I never would have thought that I could go through something like that. I learned just how strong I really am. After breast cancer surgery, about 20% of women develop some lymphedema, a painful chronic swelling of the arm following removal of lymph nodes. It can develop within days or many years after treatment. There is no known cure for lymphedema and treatment focuses on reducing the swelling and pain. Lymphedema bandages, sleeves, and compression garments offer the best relief. However, those products are not currently covered by Medicare or many insurers and are very costly for a woman who might need to pay out-of-pocket for them. The PA Breast Cancer Coalition wants to help change that, and you can help make that change happen. If you are on Medicare and found they didn’t cover the garments and sleeves you needed, and were surprised to find that you had to pay for them out-of-pocket … we want to hear from you! Your personal story can make a difference in our efforts. Tell your story to the PBCC at info@pabreastcancer.org, send a letter to PA Breast Cancer Coalition, 2397 Quentin Road, Suite B, Lebanon, PA 17042, or call 1-800-377-8828 x3020 to share your experiences with Medicare coverage for lymphedema supplies. Posted By PA Breast Cancer Coalition on May 10th, 2016 at 4:21 pm | 0 comments. Rev your engines for the 5th Annual Jeeps, Jams 4 Jugs, on Saturday, June 4 at Anthracite Outdoor Adventure Area, in Shamokin PA. The event features a Show and Shine competition, a Jeep ride, games, music, food and more! It promises to be a fun time for the whole family, with an after party from 2-6 p.m.! Interested in the event? Registration will be held Saturday, June 4 from 9 a.m. to 11 a.m. A Show and Shine competition will be held at 1:00 p.m. with judging occurring during the after party. A registration fee of $15.00 is required for entering one category, and an additional $10.00 for each category entered after. Show categories include best of show, best trail ready, best restoration and more. Each winner will receive a trophy and all proceeds of the event will directly benefit the PA Breast Cancer Coalition. Not a Jeep owner but still interested? Join us at 2:00 p.m. for a live DJ, vendors, food and children’s activities. Cost is simply a donation for your entrance fee. 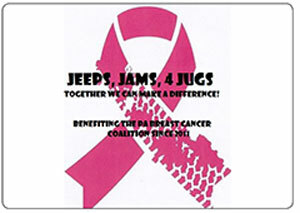 Check out all of the details on the Jeep, Jams 4 Jugs Facebook page here.